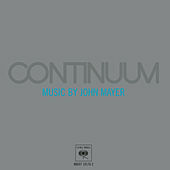 John Mayer readjusts that heart that he's been wearing on his sleeve and tackles more socially conscious subject matter, much akin to when soul icons Marvin Gaye and Curtis Mayfield had their own personal epiphanies in the '70s. Mayer's take on the upheaval in his own world is not so much a lament as an acknowledgement of the apathy of Gen Y (see songs "Waiting for the World to Change" and "Belief"). But at the core is his fluid, seemingly effortless guitar work, something that often gets overlooked for his profile as a romantic balladeer.